My kids were “Pampers” babies. From time to time we would try other products, but we would always come back to “Pampers”. Even now, I still like to have “Pampers Wipes” on hand to keep in the car and around the house for quick clean ups. “Pampers Aqua Pure Sensitive Water Baby Wipes” are Hypoallergenic wipes that are strong and durable on even the biggest messes. My children are older now, but that doesn’t mean they are any less messy. The wipes clean up their hands and faces quickly without causing any breakouts or drying their skin. The ingredient list is small: Water, Citric Acid, Peg-40 Hydrogenated Castor Oil, Sodium Citrate, Sorbitan Caprylate, Sodium Benzoate and Disodium Edta. I was unable to find the wipes in the “Skin Deep Cosmetics Database” so I looked up the ingredients and the Castor Oil and Sodium Benzoate have rated “3” which is a moderate hazard. Do your research to make sure you are comfortable using them on your child. The wipes are free of phenoxyethanol, parabens, perfume and dyes. I love that they are scent free, which means I can send a package to school with my kids for quick cleanups before lunch and snack times. The wipes comes in a resealable pouch with 56 to a pack. They are sealed with a plastic cap which makes them easy to open and close with one hand. The seal also helps keep them from drying out. Each wipe is approximate 7×8 inches. The wipes are the perfect amount of “wet”. They don’t dry out too quickly nor do they leave being too much dampness. They also don’t leave behind any stickiness or dry out my skin. Please be aware that these wipes are NOT flushable! Pampers also offers a rewards system where you can redeem points for amazing rewards. The more products you purchase the bigger rewards you can earn. 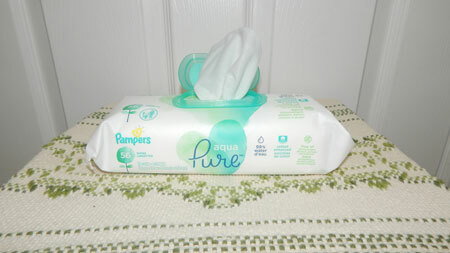 The “Pampers Aqua Pure Sensitive Water Baby Wipes” are gentle enough for bottoms, hands, and sensitive faces. *Disclosure: I received a complimentary box of “Pampers Aqua Pure Sensitive Water Baby Wipes” through the Amazon Vine Program in exchange for my review. All opinions are 100% my own.